After its cameras enjoyed a cult-like following as a series of film-based models and then later as digital versions with small sensors, Ricoh finally introduced its GR camera featuring a relatively large APS-C-size 16-Mpix CMOS sensor. The updated version, the GR II, inherits much of the same feature set, including the 16-Mpix CMOS sensor and fixed focal length 28mm (equivalent) f/2.8 lens in a highly portable yet satisfyingly ergonomic magnesium shell. At the rear, it has a 3-inch LCD with 1.23m-dot resolution display. As a high-end model aimed at enthusiasts, it has front command dial, plus a shooting mode dial on the top plate and a full complement of customizable controls to the rear. There’s also a hotshoe and pop-up flash; however, new features are somewhat limited. Over the original, the Ricoh GR II adds Wi-Fi with NFC, an improved 10-frame RAW buffer (up from 4) with continuous capture at 4 fps, an extended battery life of around 10%, and a new CTE WB mode that intensifies the principal color in a scene. The Ricoh GR II also adds wireless control of certain Pentax flashguns. Like the original, the new model features HD (1080p) video at up to 30fps. 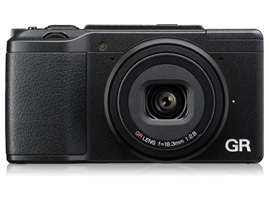 The Ricoh GR II measures a slim 4.6 x 2.5 x 1.4” / 117x63x36mm and weighs just 7.8 oz / 221g, not including battery and card. It is available now at a price of $559 (USD). 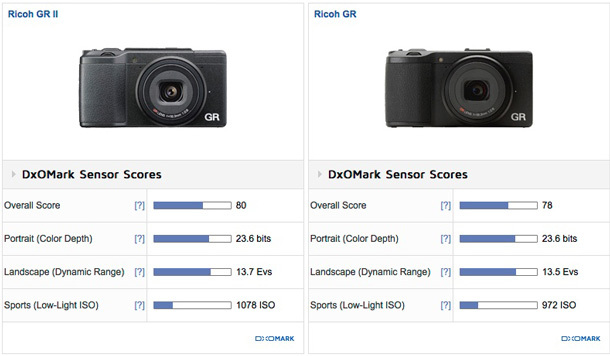 With an overall DxOMark score of 80 points, the Ricoh GR II achieved a good but not unexpected result for a CMOS sensor that has a low SNR. Scores for individual metrics were at the top end of the performance range for the sensor, with a high 23.6 bits for color sensitivity, a wide 13.7 EVs dynamic range at base, and a very respectable low-light ISO score of 1078. Against its predecessor, the sensor in the Ricoh GR II has some slight improvement in performance, but from the closeness of the results, it seems that the new model adopts the same, or at the very least, a closely-related sensor. Color depth at base ISO is identical, but the GR II result shows a +0.8-bit enhancement at ISO 800, though that drops back to a +0.2-bit gain or thereabouts from ISO 1600 and up. In turn, that enhancement can be seen in a widening of the dynamic range over the same (manufacturer’s) ISO settings, leading to a +0.45 EV advantage at ISO800, a slight improvement over ISO1600-3200, and then another not insignificant gain of around +0.5 EV at ISO6400 and up. Ricoh also achieved a minor improvement in low-light scores of around +0.125 EV, or 1/8 of a stop, but it seems like their main concern when modifying the sensor’s performance was to achieve a wider dynamic range at high ISOs, something that should greatly appeal to their target audience of street shooters. Although the APS-C size sensor lends itself well to small, highly-portable models like the Ricoh GR, it remains a somewhat niche choice. Listed at $1,100, the Nikon Coolpix A is the closest to the Ricoh in our database, with a similar 16-Mpix APS-C CMOS sensor and 28-mm equivalent lens. Although it features a 28-70mm equivalent zoom, the Leica X Vario is also a contender. It shares a similar 16-Mpix CMOS sensor, but at $2,850, it is considerably less accessible and noticeably larger than either the Nikon or Ricoh. In terms of color sensitivity — which in this instance, gives a good indication of noise levels between sensors at varying ISO sensitivities — the Leica has the edge. It has a somewhat higher measured base ISO and yet not only matches its two rivals at base, but also has generally higher sensitivity through the range. Although low noise is usually an advantage when it comes to dynamic range, the Leica performs similarly at higher ISOs. However, aided by the lower measured base ISOs, both the Ricoh GRII and Nikon Coolpix A have around a +1.0 EV wider dynamic range, suggesting that the similar Leica sensitivity has been tuned for improved low-light performance — a not unrealistic assumption, given the slower maximum aperture of the zoom. Indeed, the Leica achieved the best low-light ISO results of the three, with around a +0.25 EV improvement over the Ricoh. With the introduction of the original Ricoh GR, the company earned plaudits for its combination of smart design, high-quality output, and user-friendly ergonomics. Although there have been numerous small refinements, the Ricoh GR II has drawn ire and disappointment from the photographic community in general as an underwhelming update. Perhaps it’s a measure of the high expectations of the user base, because when viewed alone, the Ricoh GR II is every bit as capable as the original and there have been some refinements in sensor performance. Although as with some of the other upgrades, the gains are modest, with an attractive price of just $559, the Ricoh GR II is a highly desirable model.